First things first: Check your soil. If you want everything you plant this year to not only grow but thrive, make sure your soil’s pH levels are where they’re supposed to be. Grab a home-soil test from any hardware or garden store! Do some landscaping. If your lawn has experienced a rough winter, treat it to some TLC—aka a nice mow and trim. It will start to look like new in no time! Fertilize, fertilize, fertilize! Spring is the perfect time to prep for weed prevention. Spray your herbicides for weed control and coat your lawn with the appropriate fertilizer to (literally) lay the groundwork. Summertime and the living is easy. There’s just nothing like relaxing outside on a warm summer night—especially when your lawn looks good. Here’s how to help your lawn reach its summertime prime. Your lawn is thirsty! Make sure it gets the water it needs, especially in the summer. Longer days mean more exposure to direct sunlight, so be sure to water as often as necessary. Most lawns need at least an inch of water a week. Use a water gauge to determine how often your lawn needs watering, and how much water to give it. 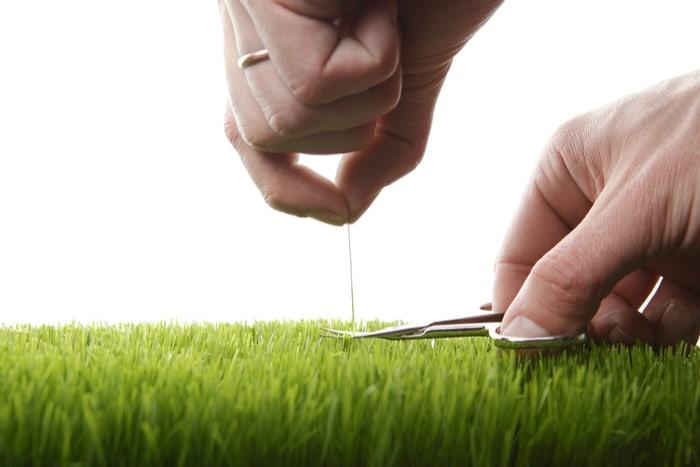 Keep it trimmed: Your grass will likely grow faster in the summer (must be all that water). Keep it at less than 2 1⁄2 inches in height to ensure your yard doesn’t start to resemble a jungle. The leaves are falling and the treetops are aglow with a wild array of reds, yellows and oranges. Unfortunately, your yard is probably full of those leaves, too. Here’s how to keep your lawn from suffering underneath. Fertilize your lawn to prepare it for the winter’s cold. Unless you’re out building a snowman, try to reduce the amount of time you actually spend on your lawn. Grass is usually more fragile in the winter, so staying off of it when it’s in this condition can strengthen it for the warmer months ahead. Rothman, Evan. (2012, April 24.) A Year-Round Plan for the Perfect Lawn. Borst, Mark. (2016, March 18.) How to Take Care of Your Lawn Year Round.